Boasting an envious nutritional profile, Creative Nature’s Chia Seeds contribute to the maintenance of normal blood cholesterol, bones, teeth and support normal muscle function. Soak in water/juice for an interesting `slimy` experience! 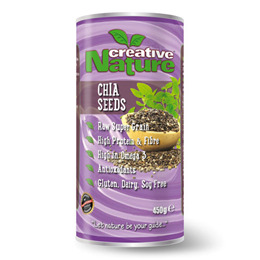 Below are reviews of Creative Nature Chia Seeds - 450g by bodykind customers. If you have tried this product we'd love to hear what you think so please leave a review.